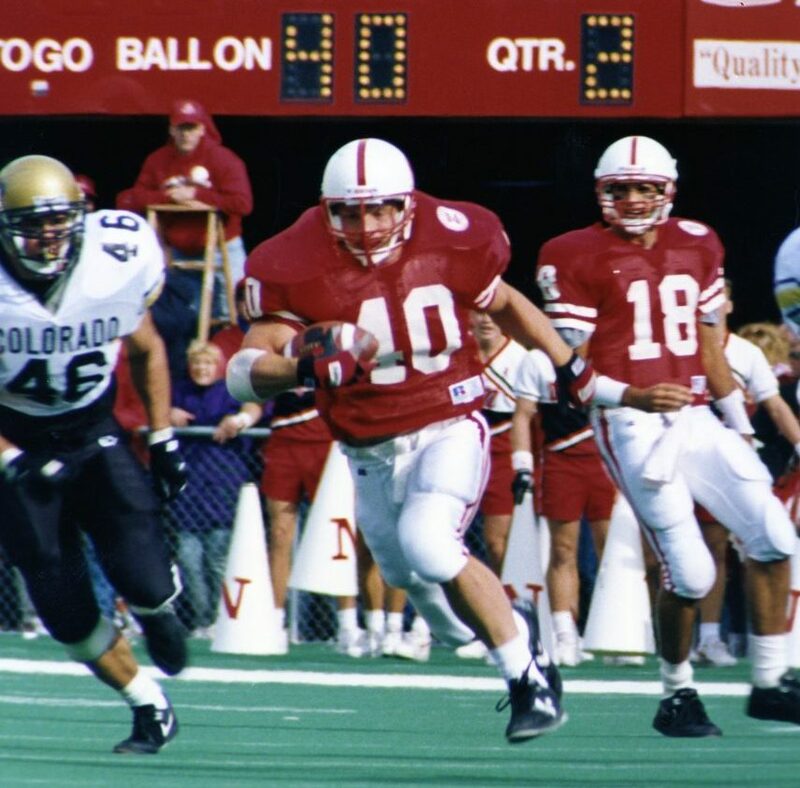 On the run vs. Kansas, 1994. Q: What could you tell me about Coach Solich? CS: Well, what I liked about him? For being a smaller in stature he was very intense. He could definitely get very intense. That’s one thing I remember. He was like a little pit bull, just ‘switch’ on you and very intense at times. Then again, he was very personable and you could talk to him. But he was about the details, and that’s what always made us better as running backs: blocking, running the ball, making sure the ball’s in the right hand. And that’s what made our running game so strong, how we became such good running backs. And I’ll always remember him saying, “We will be the leaders of this team by the way we practice. We will finish out every play, and other guys on the team will be like, ‘Wow! 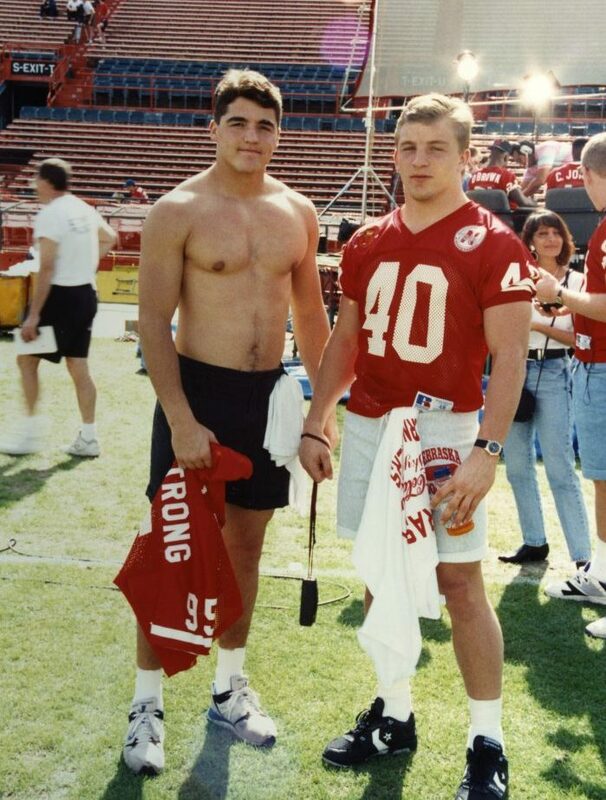 Look at these running backs. We have to keep up with these running backs.’ We don’t have to say anything, it’s just by our actions. When we’re practicing and playing games we’ll be the leaders that bring the team along.” And I definitely believe that was true, because our running game was strong. Our line and people blocking for us? They believed in us and wanted us to succeed. Q: So Frank was always fighting the ‘I’m an all-star, pretty-boy-kind of thinking‘ and instead created a sense that ‘We’re all in this together’ -kind of thing’? CS: Yep. But then again,“We will be the guys where they go, ‘Wow, look at how hard they’re working. I’m going to work just as hard as those guys so we don’t let them down.’” And that’s what we did every day in practice, and that’s why he talked about that. Q: Trying to instill fear in the the other team? CS: Yeah, and we were all very good: our pad leverage and everything. You’d hear that ‘thud’ -that hit- and it would sound so nice every time. I guarantee, if you ever hunt any of those guys down, those linebackers, if you ever got an opportunity to interview those guys and ask, “Did you ever remember seeing those guys doing that?” And I used to, before game time? I’m going even harder. Q: So your freshman year, that was the fall of ’90 when we lost to Georgia Tech in the Citrus Bowl, right? CS: Well, honestly, my freshman year I was just surviving, too. I didn’t really get a full gist of the unity and all that stuff. I was just out there trying to bang helmets and show the coaches I could do this. Q: When that the Unity Council got implemented, people seem to think that built some unity within the team and got everybody focused. Would you agree? CS: I definitely agree, because you do not want to let down your peers. You’re more like, ‘if your coach yells at you you’re going to blow them off, but if you have a council of your peers go, “Why did you not make it to class on time? Why are you not doing this? Why are you not doing that?” That’s a little bit harder than having a coach or a counselor say that.’ When you’ve got guys out there that you’re playing with, fighting with every day out there on the field? When they say, “You need to be accountable, because we need you out there.“ Even outside the classroom, that really drove the team together. So the Unity Council started and I think everything started picking up after that. Q: The motto ‘Unity, Belief, Respect,’ did that mean anything to you? That’s the cool thing. People -the coaching clinics?- there were hundreds of coaches there. And the football camps? All these kids wanted to come to the football camps and participate because they wanted to get better. And the state, the support and how they all rallied around the team at the time? And game time, there was no better feeling than playing in front of over 76,000 people and they’re all wearing red. It’s a feeling that you just can’t get anywhere. I mean, Detroit in the NFL was good, a pretty good place, they’re definitely football fans there, too. But I tell you what, the support you got there at Nebraska was amazing. Q: What was your favorite part of gameday? CS: Well, I’ll give you my first experience of game day: It was my sophomore year and we used to practice out in the stadium all the time and it was so big and empty…and game day came and that place felt so small. Q: Do you recall ever being at an opponent’s stadium and thinking, ‘Wow, this is a tough place to play’? CS: Not really, because we just had a swagger about it: “We are gonna come to your stadium and we’re gonna give it to ya.” The one place I do remember; it was pretty amazing when we played Washington. I think it was my sophomore year and we were both in the top 5 and this was a big game for us, and that had to be probably the loudest stadium I ever played in. They would always let both teams come out of the tunnel together, but they wouldn’t let us do it. Because everybody was just so ready to go, it was too intense in the hallway there. They let them come out first and we came after them, but it was one of the loudest games I ever played in. Q: What was your shining moment, where it all came together and summarized your playing time there? CS: It was a great opportunity. And that play was put in only for that game. Never ran it all year long, and during the bowl practices it was a play that worked all the time. And when they called it, in my head I knew it was going to be a touchdown. I just knew it. Q: Was that 9 yards out? CS: It was 14 yards. Q: Who called the play? Did a receiver run the play in? 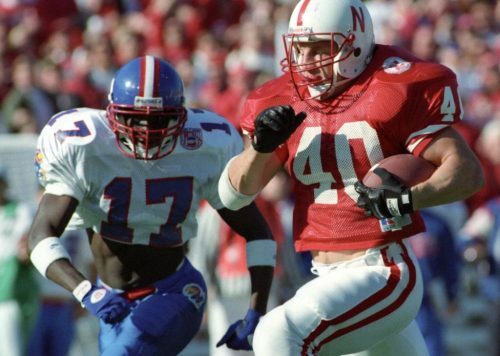 CS: A receiver ran in with the play and Tommie Frazier called it up, and I was like, ‘Holy smokes, I’m gonna score!’ I just knew it. Q: At that moment you were thinking, “I’m gonna score,” was there a also little guy on your other shoulder saying, “Do not screw this up!!”? CS: No. The confidence was there. There was nobody telling me that. Q: Did the rest of your teammates feel the same thing? The confidence? CS: I don’t know. (laughs) I hope that they had confidence in me. We only practiced the play during the Orange Bowl practices. 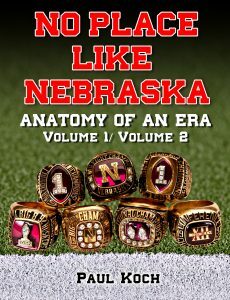 Q: Coach Osborne could always come up with new wrinkles, eh? And is there anything you wish you could do over or better or differently? CS: No, not really. I trained hard, I was Lifter of the Year. And that was voted on by my teammates, so I did the right thing there. I graduated, I did the right thing there. I played all-out every game, so there was no regrets about anything. Q: A wonderful feeling, eh? No regrets? CS: Yeah, knowing you left everything on the field? That’s something that, when you’re done, you can say, ‘I gave it all.’ There’s no better feeling than that.